DBS, the World’s Best Digital Bank (Euromoney, 2016) is on a mission to reimagine banking. Live More, Bank Less is our motto, and we aim to make banking a seamless journey for people. At DBS, we see ourselves as a 23,000-person start-up, that leverages start-up thinking, embraces an Agile culture and adopts the latest technology to design and develop superior solutions. Following the success of our inaugural Hack2Hire hackathon in 2017, we are launching this year’s edition with a grander, bolder aim of bringing in the best and brightest talents to enhance our digital offerings using Big Data, Machine Learning and Cloud Technologies, and transform how we bank. With a strong culture of innovation, experimenting with new technology and collaboration with the FinTech community, we aim to simplify banking so as to help others Live More, Bank Less. We’re looking for technologists across all levels and roles (including Scrum Masters, Mobile Application Developers, Full Stack Developers, DevOps Engineers, QA Engineers, UI/UX Developers) to join us to drive major digital transformation to reimagine banking. Based in India, you’ll leverage new technology to create solutions that provide superior client experience and are truly scalable. You will architect and develop solutions based on cloud-native principles, with Big Data and Machine Learning embedded as part of the design, and work in a truly Agile mode of continuous experimentation and continuous delivery. 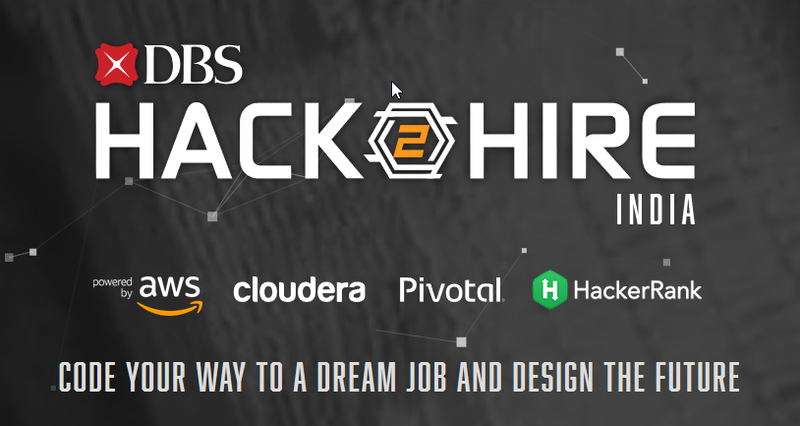 Participate in the Hack2Hire hackathon and stand a chance to be selected to be a part of our technology team that makes the impossible, possible.